Naples Metro Dante station of the is in the square dedicated to the poet, writer and politician Dante Alighieri, famous all over the world for his Divine Comedy. Dante station is not far from the Museo one, but it offers the chance to go to completely different places. 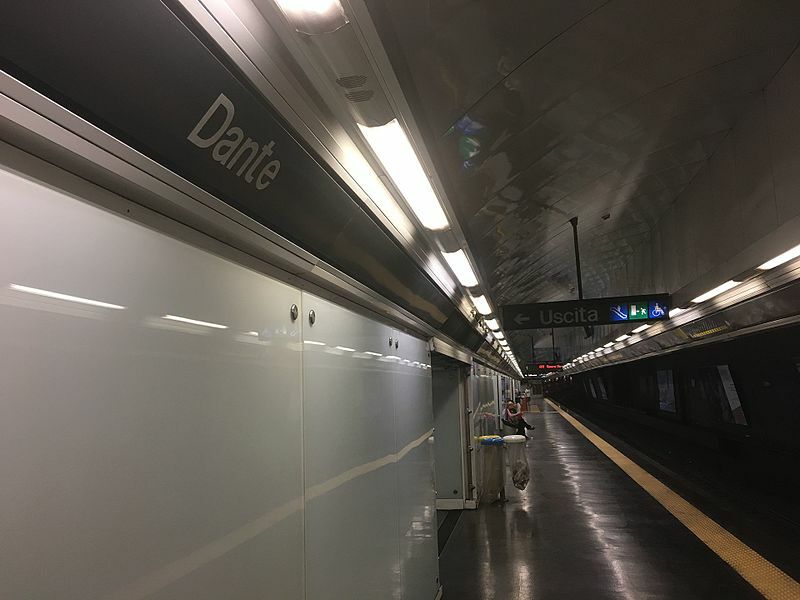 As already explained in theBookingNaples free guide to the art stations of Naples Metro, Dante station was designed by GaeAulenti. The station is famous for the glass and steel structure that frames, from afar, the statue of Dante placed in the centre of the square. Inside the station you can admire artworks by Italian and foreign artists. For example, JannisKounellis is the author of an installation made with ceramic tiles, shoes, a coat, a hat and toy trains. Joseph Kosuth created an installation with neon and fragments of DanteConvivio. Furthermore, you can also see works by Nicola De Maria, Michelangelo Pistoletto and Carlo Alfano. From the Dante station you can go to Montesanto, a station from which you can take the funicular to the Vomero district; the cumana and the circumflegrea to visit places far from the city centre and subway line 2. The attractions of Naples that you can reach starting from Dante square are the historic centre, the Bellini theatre and via Toledo. You can go to the historic centre by crossing one of the gates of the ancient city, Port’Alba. After crossing the big ancient gate made of stone, you will walk on a road full of stalls of bookstores where you can buy cheap books – even in foreign languages. The road ends in Piazza Bellini. From there, you can choose to go left, towards the Bellini Theatre and the Academy of Fine Arts (an architecture made with tufo, a typical Neapolitan material) or continue straight on, towards the Conservatory where the composer Bellini studied. In the same area, you can visit churches such as the Santa Maria Maggiore of Pietrasanta. From Dante it is possible to reach in a very short time via Toledo, one of the main streets of the city centre through which you can reach the famous Piazza Plebiscito, the Royal Palace and the Royal San Carlo Theatre.